In humanities we are making podcasts. I called mine the Gifts and Curses of War. Here it is, I hope you like it! Note: Please note that this podcast is designed to he heard. It includes emphasis, and emotion that can’t be put on a page. This was the perfect winter vacation for Nisha’s family, having some nice quality time with each other, there were definitely smiles on everyone’s face this trip. Nisha her grandparents and her family were all so happy to go on this trip, they had a perfect time at Kanyakumari a place in South India. They had a week to be together sightseeing, and going to the beach. But most of the time they just decided to stay together and spend some quality time with each other. In the last part of their stay they went over to Kerala. They all went to the beach and they made a lot of great memories, they had a great time. After that, and some more sight seeing, they were going to head back home. After arriving back in New Delhi, they arrived inside of their house at 12:05 AM on January 1, 2017. What better moment than that time to be back home. They got to spend their first moments of 2017 together. We all can tell that the Srivastava family shure had a good time, and the thing that made it all better was the fact that they had each other to share these special moments, and to bond. “I usually don’t spend that much time with my grandparents, but after this trip, I know them a little better.” Says Nisha. We can tell that nothing is better than spending time with your family. In humanities, we have been researching about 4 ancient civilaisations (Mesopotamia, India, China, and Egypt). We have learned about their life then in their civilisation, then we chose an artifact. 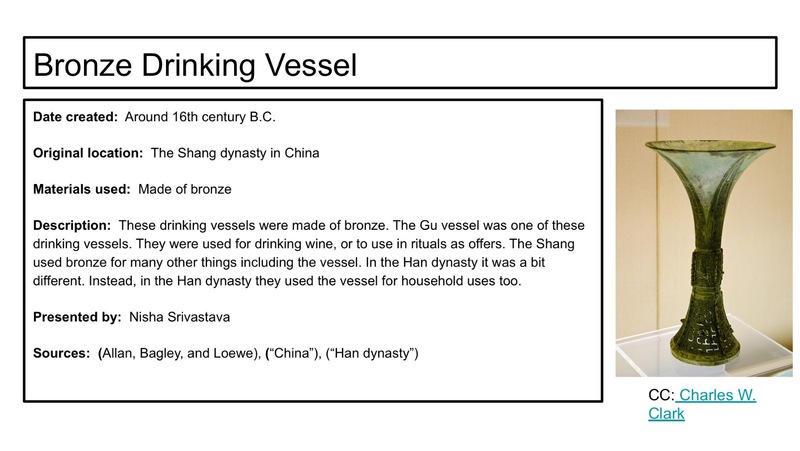 Mine was the bronze vessel. Here it is! In Humanities, we did a project where we had to write on our own Cuneiform tablets. Mine said that They were very creative. I wrote that because I think that they are very important since they invented a lot of different things. Here a picture of my cuneiform.